One technical market indicator that has gained quite a bit of focus recently is the weakness in the transport index (IYT) relative to the Dow Jones Industrials Index (DJIA). 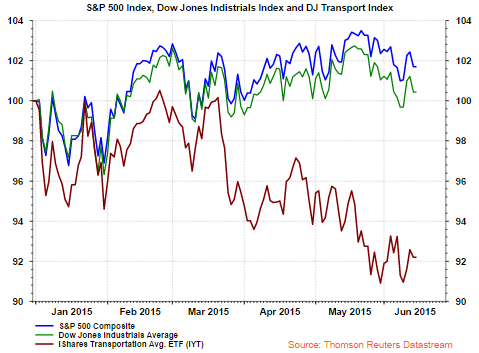 Dow Theory suggests that underperformance in the transportation sector of the market is a precursor to broader weakness in the Dow index. Earlier this month, Sam Stovall, U.S. Equity Strategist for S&P Capital IQ, noted the divergence in the transports relative to the Dow has more often than not provided false signals about a Dow correction. 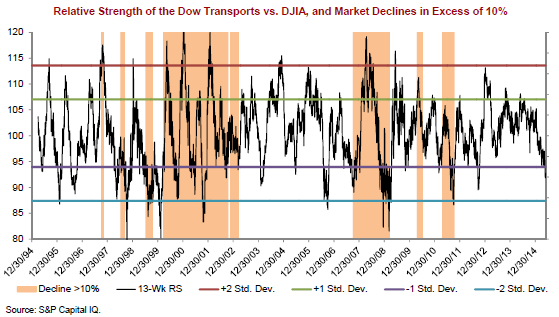 In his report he provides the following chart comparing the 13-week relative strength of the Dow Transports versus the DJIA since December 31, 1994. "The jagged black line represents the DJT’s rolling 13-week price return compared with the 13-week performance for the DJIA. Any point above 100 indicates market outperformance by the DJT over the past 13 weeks, while points below 100 indicate market underperformance. At 100, both are moving in lockstep." "The parallel bands represent one and two standard deviations (SD) above and below the long-term mean. The orange shading shows when the stock market declined by 10% or more. The relative strength is currently below 1 SD. "The takeaway from this chart is that market declines of 10% or more were indeed preceded by divergences between the DJT and the DJIA in excess of one standard deviation above or below the long-term average. 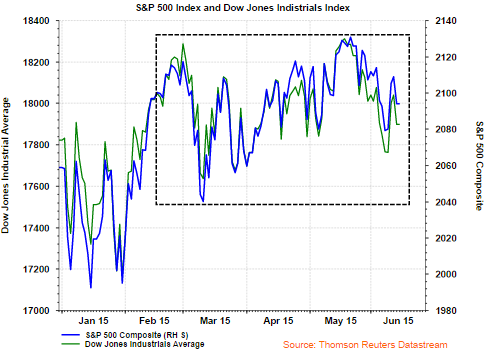 "[a greater] number of divergences beyond one standard deviation did not result in a meaningful market selloff. This was particularly true in the late 1990s, the mid-2000s, as well as during the past 3-1/2 years. Even levels of extreme divergence did not automatically result in a significant sell-off, as there were eight times that the divergence exceeded 2 SDs, yet no decline materialized soon thereafter." The market has fought off efforts to sustain any meaningful correction from a price decline standpoint. It has been over three and a half years since the S&P 500 Index experienced a correction in excess of 10%. However, it is often stated markets either correct over time or in price. As the above chart of the S&P 500 and DJIA shows, this could be one of those periods where the market is correcting over time. The dashed box on the chart highlights the range in which the S&P 500 Index has traded since February, in a range around 2,130 to 2,040. Lastly, as we noted in yesterday's post, bullish investor sentiment is at a very low level and forward returns from these low levels have mostly been strong. Additionally, Dana Lyons highlighted in a Friday article, One Measure Of Stock Allocation Just Dropped The Most In 9 Years, that individual investors have significantly reduce their equity weighting. Possibly this is one of those times the market is correcting over time.